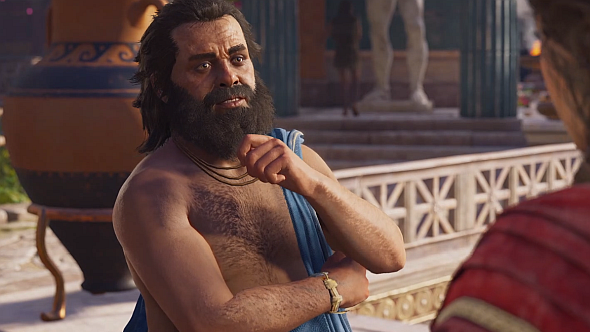 An easter egg hidden in Assassin’s Creed Odyssey sees Ubisoft take aim at Electronic Arts over the latter’s use of microtransactions in one of their recent games. The line of dialogue features as part of the game’s minotaur quest, and references EA’s response to the controversy surrounding Star Wars Battlefront II. Before you can face the Minotaur in Assassin’s Creed Odyssey, you need to gather three tokens. These can be earned by completing challenges, but in some cases you can simply buy them from the appropriate ‘Trial Masters’. Or at least, you can try. That’s a pretty direct throwback to EA’s response to the controversy around Battlefront II’s microtransactions. After that game released in November 2017, the company was accused of adding significant pay-to-win elements to the game via its cards system, and was heavily criticised for the grind attached to unlocking new heroes. In response, EA pulled microtransactions from the game. They also issued a statement on Reddit, which soon became the most downvoted comment in the website’s history. That statement began by saying “the intent is to provide players with a sense of pride and accomplishment for unlocking different heroes.” That phrase is clearly what Ubisoft has picked up on with its easter egg. As players have been quick to point out, Ubisoft is far from totally innocent when it comes to microtransactions. Assassin’s Creed Odyssey itself has been criticised for its XP-increasing microtransactions, so it feels like Ubisoft’s comment may be more or a cheeky jab at EA, rather than outright criticism.